The purpose of the relationships information area is to record relationships between different authority records - for example, predecessor/successor relationships or parent/child relationships - and between authority records and archival descriptions. To register a new relationship, under "Related corporate bodies, persons or families" click the blue "Add new" link. ICA-AtoM opens a pop-up dialogue box for data entry. Select the name of the related authority record by typing in the first few letters and selecting it from the drop-down menu. Choose from associative, family, hierarchical, and temporal in the drop-down menu. Enter the start and end year of the date range. If the start and end years are the same, enter only in the "year" field and leave the "end year" blank. Do not use any qualifiers here (e.g. "ca.") or typographical symbols (e.g. "[194?]") to express uncertainty. Enter the date range as you want it to appear in view mode. Add any additional text to qualify date range (e.g. "ca. 1940-1980" or "12 Aug. 1940 - 31 July 1980"). If you leave this field blank, the Date/end date fields will appear in the view page by default. In the authority record view page, you will see that the relationship information appears with the related entity as a link. Clicking on the link will take you to the authority record for the related entity. Note that the relationship information is captured on the view page of the related authority record. Editing the relationship information in either authority record will save changes to the information in both authority records. 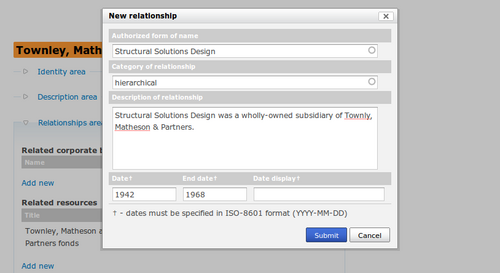 In ISAD, creator and accumulator relationships between archival descriptions and authority records can be created either from the archival description edit page or from the relationships area in the authority record edit page. Other types of relationships (contributor, publisher, collector, etc.) can only be created in the relationships area of the authority record edit page. When you open the relationships area in an authority record that has already been selected as the creator for an archival description, you will see this relationship listed under related resources. To register a new relationship, under "Related resources" click the blue "Add new" link. ICA-AtoM opens a pop-up dialogue box for data entry. Select the title of the related archival description by typing in the first few letters and selecting it from the drop-down menu. "Describe the nature of the relationships between the corporate body, person or family and the related resource, e.g. creator, author, subject, custodian, copyright owner, controller, owner." The values in this drop-down menu are derived from the event types taxonomy. (RS-2#6.3) For instructions on editing taxonomies, see add/edit terms. ICA-AtoM currently permits only one default resource type, "archival material". 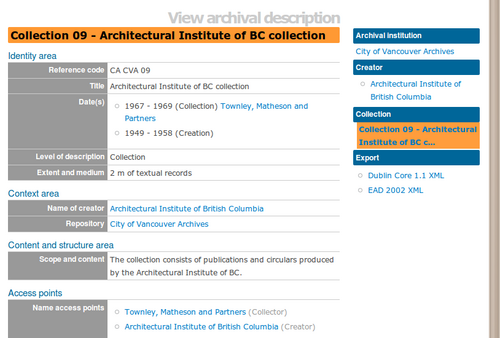 Relationship displayed in authority record's context menu: in this case, "Collector of"
The authority record's context menu will now show the relationship to the archival material. The related archival description view page will also show the new relationship in the Date(s) field and as a name access point. This page was last modified on 12 July 2010, at 17:55.